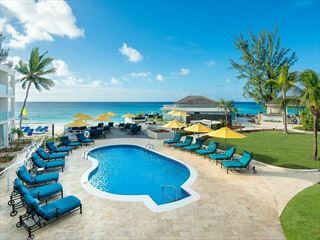 Offering fantastic self-catered accommodation on the South Coast of Barbados, Ocean Two Resort & Residences is a great choice if you’re looking for a vacation on your own terms in one of the most beautiful places in the world. 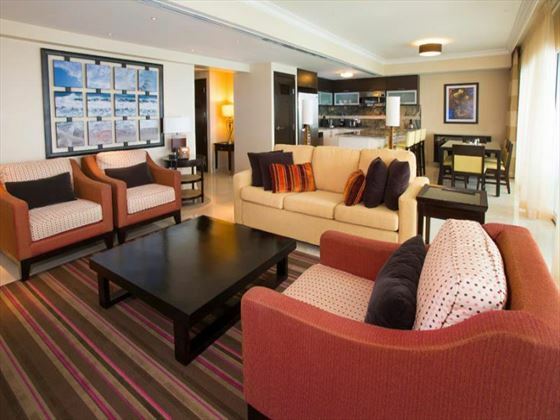 The suites are furnished to a very high standard, offering all the amenities you need to have an amazing time. 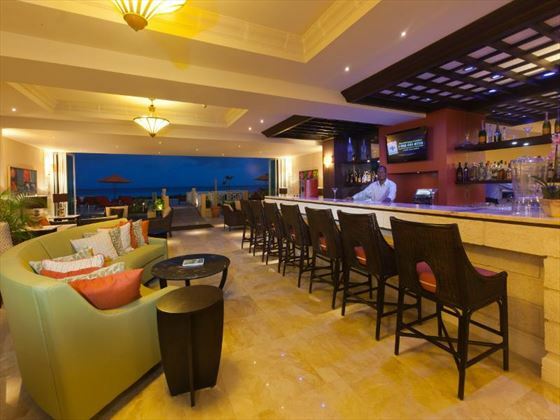 You’ll find air-conditioning in every room, plus kitchenette facilities, flat screen TVs and complimentary Wi-Fi access. You’re based within close range of St Lawrence Gap and Oistins, meanings it’s easy to find bars and restaurants if you’re looking for a night out. Hotel Room - Has one king bed and a balcony that has a partial ocean view. Please note these rooms do not have any catering facilities. One Bedroom Ocean Front Suite - Has one king bed and a sleeper sofa. There is a spacious living and dining room and a fully equipped kitchen, complete with stainless steel refrigerator, dishwasher, convection oven and stove-top, as well as a washer and dryer. 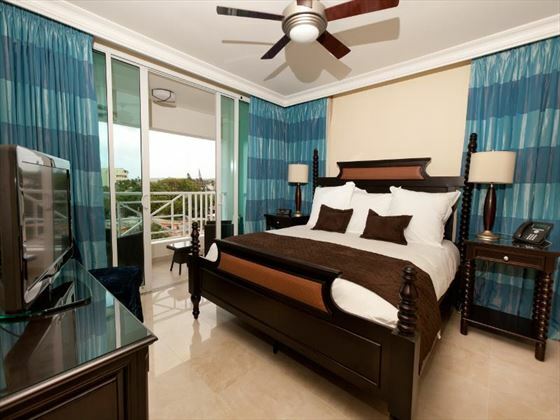 Two Bedroom Ocean Front Suite - The master bedroom has one king bed and a balcony with a partial ocean view and an en suite bathroom. The second bedroom has one king bed and partial ocean view from the windows; there is a second bathroom. The residence has a large living room with a sleeper sofa; a dining room and a fully equipped kitchen complete with stainless steel refrigerator, dishwasher, convection oven and stove-top, as well as a washer and dryer. 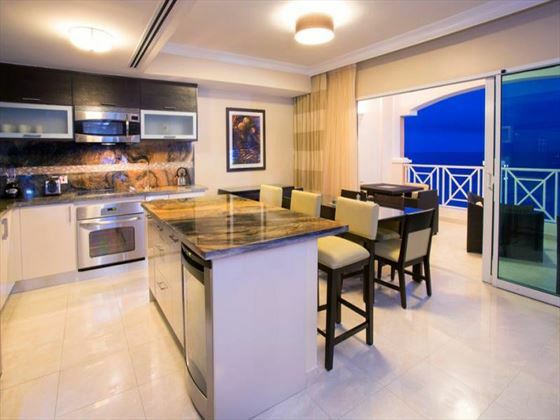 All Two Bedroom Ocean Front Suites have balconies with direct, ocean and beach views. 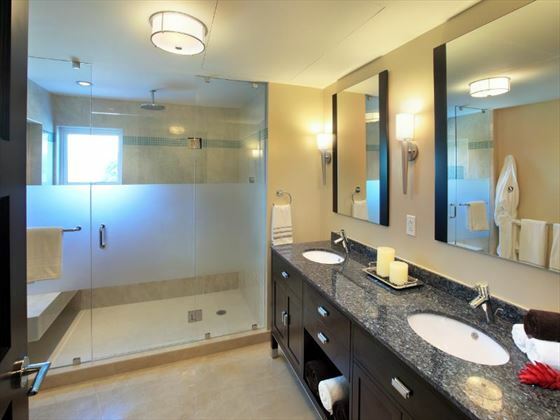 Two Bedroom Bay View Suite - The master bedroom has one king bed and a balcony with a partial ocean view and an en suite bathroom and soaker tub. The second bedroom has one king bed and partial ocean view from the windows; there is a second bathroom. The residence has a large living room with a sleeper sofa; a dining room and a fully equipped kitchen complete with stainless steel refrigerator, dishwasher, convection oven and stove-top, as well as a washer and dryer. 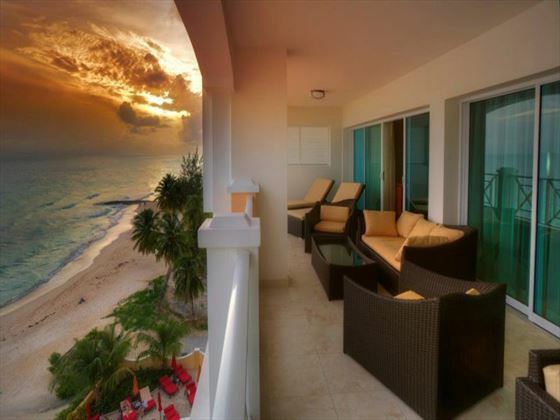 All Two Bedroom Bay View Suites have balconies with partial, ocean views. 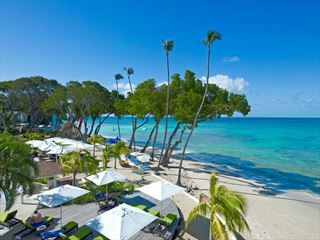 In-room spa services as well as massages in a private area on the Roof Deck Patio overlooking Oistins Bay are available. 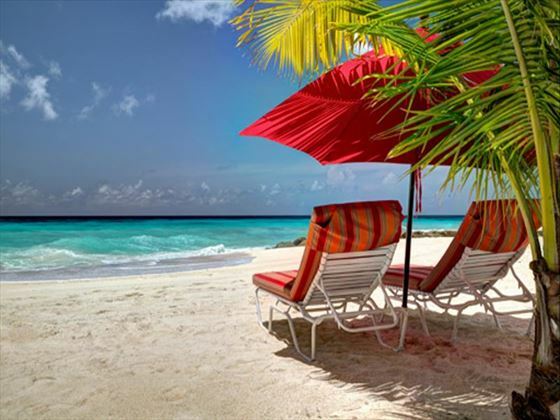 With a secluded bay, the swimming conditions are ideal. Boulder rocks and existing reef just beyond the shore create a great place for a leisurely snorkel or for the more adventurous, swim out a little further and enjoy a dive. 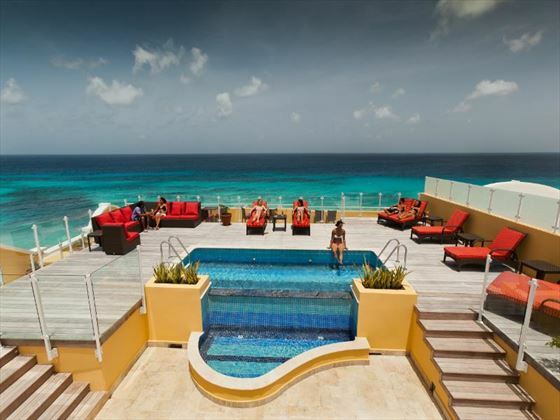 Ocean Two has a 150ft pool with a large deck, lounge chairs and umbrellas and exquisite ocean views; or choose to relax in one of the poolside cabanas and allow the day to drift away. Taste Restaurant - serves breakfast, lunch and dinner. 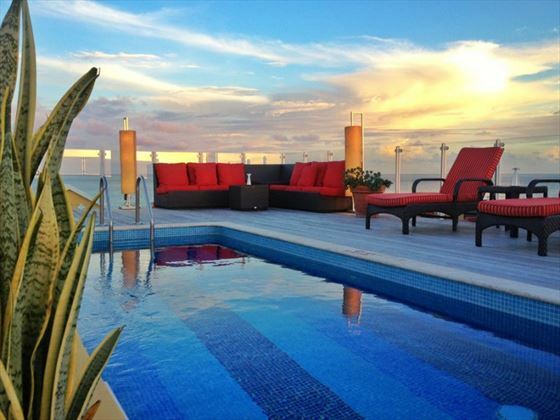 Seating available inside or on the pool deck with ocean views. Panorama Roof Deck Bar - serving cocktails, drinks and snacks during the afternoon and evening. During the day ladies are required to have bathing suits covered and shirts or t-shirts are required for gentlemen. Bare feet are not allowed in the restaurant at any time, wet swimsuits are not allowed at any time when dining in Taste restaurant or sitting in the Oasis Lounge. Ladies and gentlemen are requested to have swimsuits covered or shirts on when using the lobby or lounge area. After 6:30pm elegantly casual resort wear is recommended throughout the property.